Protecting the public interest is the most significant reason for regulating social work practice. Licensure is the best way to achieve that goal. Congratulations on earning your degree and welcome to the noble and deeply satisfying profession of social work. The social work profession is distinct from other helping professions because social workers promote social justice and social change on behalf of clients and society in addition to enhancing individual well-being. This dual focus is embodied in the profession's Code of Ethics, which calls for social workers to help people function the best they can in the environments in which they live and to work for social change. This dual focus was well articulated by two students I heard while I was at the 2018 Legislative Education and Advocacy Day in Boise, ID, sponsored by the state chapter of NASW. They were among more than 300 social work students at the capitol learning about and experiencing social work advocacy. In response to one speaker's question about why they chose social work as a profession, their truly inspiring answers were: "As a child, my family was helped by a social worker, and I want to make a difference for others the way she made a difference for me," and "I believe that social workers are the 'equalizers of society,' and I want to right some of the wrongs in society." By earning your social work degree, you have completed the first step on your journey as a professional. The next step is to obtain a social work license because, in most states, in order to practice as a social worker—or even to call yourself a social worker—you must be licensed. 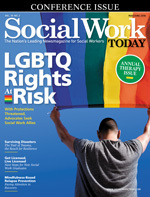 Social work licensure serves multiple purposes by benefitting the social worker, their clients, and the general public. However, safeguarding the public interest, or public protection, is the most compelling reason for regulating social work practice. Licensure declares that social work is a learned profession that affects public health, safety, and welfare, and, therefore, the state must ensure that only qualified persons are permitted to practice as defined in state law. Furthermore, according to the Association of Social Work Boards (ASWB), if a licensed professional harms a client, the client has legal recourse under the law to mitigate that harm (ASWB, 2015a). In most jurisdictions, the title of social worker is protected, which means that you need to be licensed to call yourself a social worker. A licensed social worker provides "a practice backed by a legal guarantee—that service will be safe, competent, ethical, and responsible" (ASWB, 2015b). State regulation declares that licensed professionals merit and should receive the confidence of the public, and licensed social workers can be trusted to hold their client's best interests as a priority. Public protection is the social justice mandate of social work regulation. When state governments recognize the importance of the profession through regulating its practice, by extension they recognize the fundamental role of social justice in safe, competent, and ethical practice. That social work has earned its place as one of the most important licensed helping professions is a statement to the power and value of the profession and the values of social workers themselves. Today, social work licensing is a fact of professional life. The public would not seek services from an unlicensed doctor, nurse, dentist, or attorney, nor would you. What more and more social workers are finding is that licensing is simply a good idea. The ASWB is the nonprofit association of social work regulatory bodies in the United States and Canada comprising the 50 U.S. states, the District of Columbia, the U.S. territories of Guam and the Virgin Islands, the U.S. Commonwealth of the Northern Mariana Islands, and the 10 Canadian provinces. All these jurisdictions regulate the profession, and according to 2017 data these 64 member boards count almost 500,000 licensed social workers in North America (ASWB, 2017b). • Bachelors: 40 U.S. jurisdictions. These numbers represent a 25% increase over the past 10 years (ASWB, 2017b), and the Bureau of Labor Statistics (n.d.) predicts the social work profession will continue to grow at a 16% pace through 2026. These numbers also speak to the evolving acceptance of professional regulation and licensure as an integral part of the social worker's identity, responsibility, and commitment to prudent practice. Social workers bring an ethical perspective that is enhanced through licensure, and licensure in turn strengthens the core values of the profession through public protection. To become licensed, social workers must demonstrate that they have the knowledge, skills, and abilities to practice safely, competently, and ethically upon entry to practice, and pay licensure fees. The requirements for licensure are often called "three E's and a fee," referring to education, experience, and examination, as well as fees paid to the jurisdiction for license application processing and to ASWB for the examination. The required education is a bachelor's or master's degree in social work from a social work program accredited by the Council on Social Work Education in the United States or the Canadian Association for Social Work Education. The experience component varies according to the particular category of licensure and by jurisdiction. For example, to become a licensed clinical social worker you will need to accumulate anywhere from one to five years of supervised experience, depending on jurisdictional requirements (ASWB, n.d.). The ASWB examinations are offered in four professional categories—Bachelors, Masters, Advanced Generalist, and Clinical. A small number of jurisdictions also offer an associate examination for paraprofessional licensure (ASWB, 2018a). Most social workers who take the ASWB licensure exams pass on their first attempt, and there are two reasons for this. First, licensure exams are "designed to measure the minimum competency acceptable to practice" (ASWB, 2018a). Second, the ASWB exams are "carefully created and maintained in ways that ensure fairness and consistency. The exams are intended to measure what you are expected to know on your first day on the job, and what professional social workers at your category of practice are already doing" (ASWB, 2018a). ASWB publishes national pass rates for first-test takers on its website (www.aswb.org/exam-candidates/about-the-exams/pass-rates). To have exams that are valid and reliable, ASWB has built a solid foundation that includes a rigorous practice analysis that is conducted every five to seven years. The practice analysis is a survey of social work practice in a wide variety of work settings and geographical locations, and survey responses reflect diversity in race and ethnicity as well as age and gender. More than 23,000 licensed social workers from every U.S. state and territory (except Guam and the Northern Mariana Islands) and all 10 Canadian provinces responded to the most recent practice analysis survey, reflecting the largest participation in ASWB history (ASWB, 2017a). Following the practice analysis, an examination content outline is developed for each exam category based on the identified competencies that social workers need upon entry to a particular category of practice. These content outlines are also used to generate the anchor forms used to establish the passing scores. Multiple versions, or forms, of each exam are maintained to ensure that candidates who retake the test will not answer the same set of questions. A psychometric process called equating ensures that the passing score for each form represents a consistent level of difficulty, meaning that a passing score on these pass/fail exams is a pass in every jurisdiction. High-quality, relevant exam questions are written for each examination content area by practicing social workers selected by ASWB to reflect diversity in practice setting, ethnicity, race, and geography. The questions are then reviewed by the ASWB Examination Committee, a group of experienced social workers who approve all questions before they appear on the exams. The committee is made up of proficient question writers and is balanced for racial, ethnic, geographical, and practice diversity. All this "homework" is done before an examination form is released and candidates sit for the exam. Each form contains a total of 170 multiple-choice questions, 150 of which count in determining the candidate's score. The remaining 20 items are unscored pretest questions scattered randomly throughout the exam. A final note about these high-stakes exams: The practice analysis and the exams are based on the guidelines of the American Psychological Association, the Joint Commission on Standards for Educational and Psychological Testing, the American Education Research Association, and the National Council on Measurement in Education. Candidate-Handbook.pdf) and read it in its entirety. The handbook contains explanations and hints to help you understand and embrace the entire examination process. To get licensed, you will need to follow three steps. 1. Apply for a license in the state where you would like to practice. Once the state licensure board processes your application, the board will notify ASWB that you are approved to sit for a specific category of exam. Candidates often call ASWB before they have contacted their licensing board or when they cannot reach their licensure board. ASWB staff will assist you in contacting the correct licensure board, but ASWB cannot sign you up for the exam without proper authorization from your licensure board. 2. Register for the exam with ASWB. After your board has approved you to sit for the appropriate exam, you can register for that exam online or by phone. Test-takers with disabilities may request accommodations by documenting their disability and getting approval for the accommodations before registering to take the exam. After your exam registration is processed, you will receive an Authorization to Test by e-mail. Your Authorization to Test is good for one examination only and may be valid for up to one year. Your Authorization to Test may contain an earlier expiration date, if required by your jurisdiction (ASWB, 2017c). 3. Schedule and take your exam with Pearson VUE, ASWB's testing contractor. Exams are administered on computers at test centers throughout the world. You can take a virtual tour of the test center at the Pearson VUE website (www.pearsonvue.com/ppc). Test-takers receive an unofficial score report at the test center immediately after completing the exam. Official results are transmitted to the licensing boards within two weeks. If you pass the exam, your board will process your license. If you are not successful, you may apply to retake the exam in 90 days with the board's approval (ASWB, 2017c). • The Examination Candidate Handbook is available as a free download and was discussed earlier. • The ASWB Guide to the Social Work Exams, 2nd edition, helps you understand the exam itself and how the exam questions are structured. The ASWB exam guide explains how the exams are created, includes content outlines and suggested references, and assists you in creating a customized study plan. The print version is $20 (plus shipping) and the e-book version is $15. • The ASWB online practice test is available only to candidates who have registered with ASWB to take an exam. ASWB offers practice tests for the Bachelors, Masters, and Clinical exams, and candidates may purchase a practice test only for the exam that they have registered to take. These tests use retired questions from past ASWB exams, and the software is modeled on the software used to administer the social work exams. These are full-length practice tests with 170 multiple choice questions. They are available for $85 for a 30-day access that includes one opportunity to take the four-hour timed test, receive diagnostic information, and time to review questions, answers, and rationales. These three resources are the only materials published by ASWB and that ASWB can recommend as materials to help you understand how the exams work and what to expect on the day of the exam. They are not designed to prepare you to pass the exams, but they can help you understand your strengths and weaknesses. Other test preparation materials that use ASWB's name are not products affiliated with or endorsed by ASWB. How Do I Manage All of This? In addition to supporting social workers through the licensing process, ASWB offers another service, the Social Work Registry (www.aswb.org/licensees/social-work-registry), which is time-saving for social workers and a trusted verification source for regulatory boards. The registry allows you to create and store online in a secure repository primary source records that are verified by ASWB such as your transcripts, supervision records, and exam scores, as well as other important career materials such as your résumé and professional credentials. The registry will request, verify, submit, and safely store the many critical documents you need for your initial licensure or for a future move. When you need stored documents to be filed with a licensing application or forwarded to another board, the registry will submit the information on your behalf. Your personal professional document library can grow as your career grows, and your most valuable career documents are secured in one place. Once you have passed the exam and fulfilled all of the licensing requirements in your state, you will receive your license in the mail. Celebrate this professional accomplishment and be sure to display your license in a conspicuous place where your clients can see it. You will need to renew your license periodically (consult your state regulatory board), and most boards require a certain number of continuing education credits every renewal period, including ethics training. Congratulations again on earning what I consider to be the most marketable of degrees. I can speak from my own experience, having had five career paths on one MSW degree: clinical social worker, social work adjunct educator, macro practitioner (serving in executive leadership positions in for-profit and nonprofit organizations and social work agencies helping to set and administer policy), professional volunteer on nonprofit boards, and regulator. The possibilities are similarly unlimited for all graduates, and I encourage you to explore the many paths for service this noble profession offers. — Mary Jo Monahan, MSW, LCSW, is CEO of the Association of Social Work Boards. Association of Social Work Boards. (n.d.). Quick report: Supervision requirements for individual licenses, all states [ASWB laws and regulations database]. Retrieved March 10, 2018, from http://www.aswbsocialworkregulations.org/jurisdictionSupervisedExperienceRequirementsReport.jsp. Association of Social Work Boards. (2015a). Model social work practice act. Retrieved from https://www.aswb.org/wp-content/uploads/2013/10/Model_law.pdf. Association of Social Work Boards. (2015b). Social work licensing: Why it matters. [Brochure]. Culpeper, VA: Author. Association of Social Work Boards. (2017a). Analysis of the practice of social work, 2017. [Summary document]. Culpeper, VA: Author. Association of Social Work Boards. (2017b). [Annual dues reports from member jurisdictions]. Unpublished raw data. Association of Social Work Boards. (2017c). ASWR examination candidate handbook. Retrieved March 10, 2018, from https://www.aswb.org/wp-content/uploads/2013/12/Candidate-Handbook.pdf. Association of Social Work Boards. (2018a). ASWB guide to the social work exams. 2nd edition. Culpeper, VA: Author. Bureau of Labor Statistics, U.S. Department of Labor. (n.d.). Occupational outlook handbook: Social workers. Retrieved March 10, 2018, from https://www.bls.gov/ooh/community-and-social-service/social-workers.htm.